I started to put on weight between 2nd and 3rd grade. I had always been the "chubby" girl and actually went to Weight Watchers for the first time after 7th grade. I remember returning to 8th grade a slimmer, trimmer me and the boys made such a fuss over it. However, the weight came back. All through high school I dreamed of having a boyfriend and going to dances and proms. Of course that never happened; I didn't even go to my senior prom. I just continued to put on weight. When my sister got married, she made me feel so special by asking me to be in her wedding. But I will never forget the seamstress saying, "We can just order 2 dresses and I will make one out of them.” I cried the whole way home. My nephew and niece came along and loved me no matter what. They always looked out for me as I continued to get bigger. 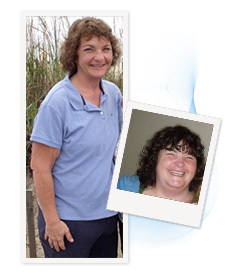 At 32 I looked into gastric bypass and said, “No way, that's not for me. I can do this without surgery.” I met my husband in 2004 and never expected to find with anyone the love that we have together. I just knew in my heart that I would always be alone. I became a wife, mother, and grandmother all in the same day. Soon I noticed that I was making excuses to get out of things that I couldn't physically do. I had 3 grandchildren and a nephew and niece who just wanted me to play, but I couldn't and this broke my heart. When I couldn't physically climb the stairs to see my niece’s new room I knew I needed to do something or I would never see the kids grow up. It was the first time I realized that I was slowly killing myself. I looked into gastric bypass again and knew that I needed to do this because I wasn't making any changes the way I was going. I researched and talked to others who had had surgery. I talked to my husband and he said he wanted me to do what I felt was best for me, that he would support me the whole way and love me no matter what. I then talked to my family and told them what we had decided and they also supported me 100%. My mom and sister went with me to the consultation and I felt at home the entire time. The surgeon met with us and gave us a wealth of information. I knew this was the right place to be. Everyone there is very loving, caring and supportive. I had some complications with surgery and had to stay longer than most, but My surgeon and the nurses and staff were awesome! They even went out of their way to make sure that my family was comfortable. Every follow-up visit has been the same as the first. I can't praise them enough. I couldn't have made it this far without them! They provided care that was beyond exceptional. I never expected my life to be as it is now! I have more energy then what I know to do with most days. My relationship with my husband just keeps getting stronger. We take long walks together and our intimate life has become incredible! We spend every moment possible together. I can do things with the kids now and we have a blast! One of my favorite things is to be on the trampoline with them! They love it as much as I do. I work with special needs kids and I feel my work has improved too because I am able to do more with them to help make their lives complete. I also am a Brownie leader and I love it! My life just keeps getting better as it goes on. If you have spent years going up and down like a yo-yo and are missing out on things in life, then gastric bypass is the way to go! The only regret that I have is that I didn't do it much sooner. Use our BMI calculator to see if you qualify for weight-loss surgery.